1930s in the United States: 1930, 1931, 1932, 1933, 1934, 1935, 1936, 1937, 1938, 1939. 1930 – The Democrats take Congress in the Midterms. Will keep it until 1946. 1931 – Empire State Building opens in New York. 1931 – Japanese invasion of Manchuria, start of World War II in the Pacific. 1931 – The Whitney Museum of American Art opens to the public in New York City. 1932 – Hans Hofmann – influential artist and teacher emigrated to the United States from Germany. 1933 – Chicago Mayor Anton Cermak killed during a failed assassination attempt on President-elect Roosevelt. 1933 – 20th Amendment, establishing the beginning and ending of the terms of the elected federal offices on January 20. 1933 – Roosevelt becomes the 32nd President and Garner Vice President. They are the last president and vice president to be inaugurated on March 4. 1933 – Giuseppe Zangara assassinates Chicago mayor Anton Cermak; the intended target was President-elect Roosevelt, who was not wounded. 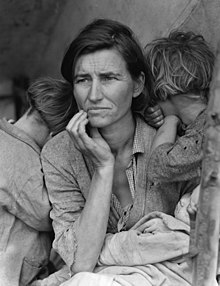 1934 – Dust Bowl begins, causing major ecological and agricultural damage to the Great Plains states; severe drought, heat waves and other factors were contributors. 1935 – The F.B.I. is established with J. Edgar Hoover as its first director. 1940s in the United States: 1940, 1941, 1942, 1943, 1944, 1945, 1946, 1947, 1948, 1949. 1941 – Regular commercial television broadcasting begins; NBC television launched. 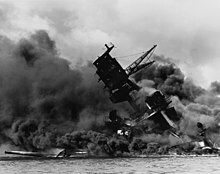 1941 – Attack on Pearl Harbor; U.S. enters World War II by declaring war on Japan the next day on December 8; and three days later against Germany and Italy. 1942 – Japanese American internment begins, per executive order by President Roosevelt; the order also authorizes the seizure of their property. 1942–1945 – Automobile production in the United States for private consumers halted. April 12, 1945 - Vice president Truman takes over after being Roosevelt's VP for only 88 days. 1946 – Philippines regain independence from the U.S.
1946 – Republicans take control of Congress for the first time in 16 years. 1947 – Truman Doctrine establishes "the policy of the United States to support free peoples who are resisting attempted subjugation by armed minorities or by outside pressures"
This page was last edited on 20 April 2019, at 04:12 (UTC).